Yellow indicates completed lanes, green indicates lanes under construction and blue indicates projected lanes. A cycle lane in the city. As part of a so called Sustainable Mobility Plan, supported by the World Bank, construction began on EcoBici's lanes and stations in 2009, and the service was opened to the public in 2010, with just 3 stations and 72 bicycles. However, by 2013 these numbers quickly grew to 29 stations and 800 bicycles. The system's expansion has been fairly rapid and will eventually have 200 km (120 mi) of lanes, 200 stations and 3,000 bicycles when completed. By the end of 2014, the stations became automated (with the exception of a few) and registered users could now access bicycles 24 hours per day with use of a smart card, while the number of stations had grown to 49. 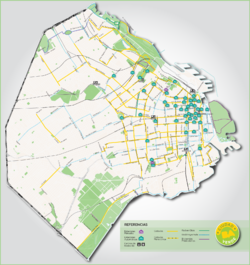 With the expansion of the system, 5,000 additional parking areas for bicycles were added throughout the city. Bikes can be retired with the use of a smart card or by use of a mobile phone application, which require proof of identification in order to attain. Tourists can register online using a scanned ID or by visiting a local municipality office. In both cases, the usage of the bicycles is free. In the case that a bicycle is not returned on time, the user is banned from one week from the service, increasing exponentially with repeat offenders until the fourth offence when the user is banned indefinitely from using the service. Wikimedia Commons has media related to EcoBici (Buenos Aires). ^ "Ecobici - Cómo utilizo el sistema". Archived from the original on 20 June 2018. Retrieved 4 February 2019. ^ Pedaleá la ciudad, buenosaires.gob.ar. ^ "Ecobici - Preguntas frecuentes". Archived from the original on 5 June 2018. Retrieved 4 February 2019. ^ "Movilidad - Misión y objetivos". Archived from the original on 4 February 2019. Retrieved 4 February 2019. 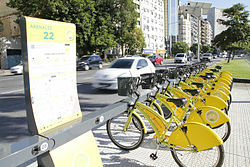 ^ "The most "human" bike-sharing system in the world lives in Buenos Aires". Archived from the original on 16 July 2018. Retrieved 4 February 2019. ^ El sistema más humano de bicicletas compartidas está en Buenos Aires - World Bank, 7 March 2013. ^ Más de 2 millones de viajes en el sistema gratuito Ecobici - Buenos Aires Ciudad, 29 November 2013. ^ Ya está funcionando el Sistema Automático EcoBici - Buenos Aires Ciudad, 8 April 2015. ^ ¿De qué se trata la propuesta Ecobici? - Universia, 2 June 2014.